To help you enjoy the upcoming Easter holidays at Habitat, we’ve listed our store opening hours below so you know when to eat, shop and indulge, and when to head to the beach instead. Bende - reduced timetable. Check website for details. All stores open as per normal trading. All other retailers closed (as per normal trading). Tigmi Trading - open 10am-2pm. Note: Times are correct at date of publish. 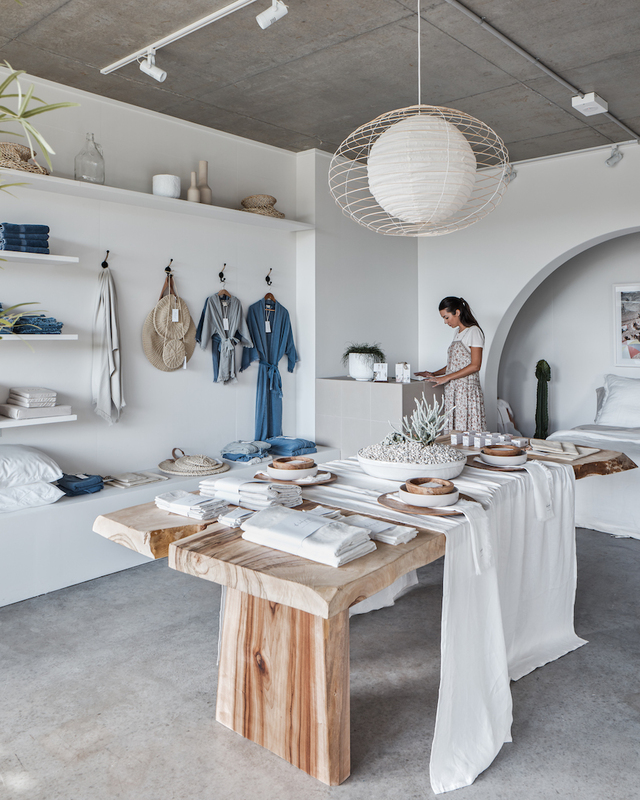 For any changes to store opening hours follow @habitat_byronbay and individual brands. We are thrilled to welcome exclusive Aveda salon Zanzi - Holistic Hairdressing joining Aesthetica in C5 Building to transform the block into a wellness space along with other new businesses coming soon! We caught up with owner Kerri Brydon on her decision to expand at Habitat. Thanks for taking the time during your busy fit-out to meet with us Kerri! How long have you been working in the area? Zanzi is the new kid on the Habitat C5 block, so only recently have I started working here. This is your second salon - When did you establish Zanzi Hairdressing? We opened our first salon in early 2018 at Cornerstone Stores in Tugun, QLD. Wow, that’s quite a quick expansion! What was the attraction of Habitat as the second Zanzi salon? What matters to us most is community vibe, a sustainable eco-friendly environment and being close to nature… we found the perfect match with Habitat! How do you and your team support the community ethos of Habitat? We take a holistic approach to hairdressing and this extends to our team. We believe in order to perform at your best it is important to enjoy where you work and establish a healthy work-life balance. The Live, Work and Play concept has attracted like-minded creatives making it an inspiring place to come to daily. Who would be interested in your services? Our Zanzi tribe consists mainly of beautiful (inside and out) women who were tired of visiting large, loud chemical-fueled salon spaces and after leaving (with a hefty bill!) weren’t even happy with their hair. We give back to the community through charity and our sustainability program, we only use and recommend brands who support our no-harm approach (no harm to the planet, animals and ourselves) so anyone visiting our salon can feel good about making an eco-conscious choice. There’s a movement happening with more and more toxic-free beauty options which we proudly support and prove you no longer need to sacrifice your health for beauty. What are the plans (upcoming projects) for Zanzi? Where can your clients find out more info? The ability to make people feel and look great! Zanzi has a New Client Offer available for March 2019 bookings. Receive a free hair cut with any colour service. Book online or call the Habitat salon on 0433 881 339. Habitat is a proud supporter of Compost Central and the pilot site for the new Subpod community system (read: worm farms). We took some time to meet with the passionate founder/director/inventor, Andrew Hayim De Vries, to find out what he loves most about his work and what keeps him motivated. Thank you for taking the time to meet us Andrew! A simple question to start: Where do you live in Byron Bay? I live in the heart of the Arts and Industrial Estate Byron Bay - just down the road from Habitat! How long have you been living or working here? I’ve lived in Byron Bay for over four years now and love it here. When did you establish Compost Central? I started Compost Central in Melbourne 5 years ago and then moved up to Byron in December 2014. Prior to that I was running ‘Compost Install’ in Fremantle, WA. My background is art and green design with over 40 years as a practicing composter! Since moving to Byron Bay I’ve been focussed on developing my Subpod composting technology that makes mess and smell free composting fun and easy for everyone, from a single household to entire communities. As a bonus our systems grow bumper crops of nutrient dense veggies. What was the attraction of Habitat as the pilot site for the Subpod community system? The community vision and the commitment to process organic waste onsite at Habitat just fitted so well with our goal of making composting and growing food a part of everyday life. To be able to collaborate closely with a world class live-work community that is just around the corner from Compost Central has made it much easier for our team to develop our Subpod community organic waste system that is now getting interest from around the world. Definitely a perfect fit! How do you and your team support the community ethos of Habitat? We design organic systems that fit with the architectural & cultural ethos of Habitat, but more importantly we are helping to grow community and connect people to nature via the collaborative management of the Subpod systems. Community values and a connection to our natural environment is a huge drawcard for people moving to the Byron Shire and I’m proud to be a part of helping Habitat support this ethos. What type of people would be interested in the Subpod? Anyone interested in reducing their environmental impact or eating nutrient dense food! When composted properly organic waste is food for the soil and vital for growing healthy food. But in Australia organics is up to 50% of household waste that ends up in landfill, creating harmful greenhouse gasses and leachates. We need to change this urgently. Subpod takes the hard and smelly work out of composting and acts as a growth hub within a veggie garden with worms and microbes feeding the soil as they compost your waste. Subpod fits anywhere people want to convert the resource of food waste into accessible, nutritious food through healthy soil. We hope to see it used in backyards, communities, schools, and developments around the world. What are the plans (upcoming projects) for Compost Central? Subpod has been developed on the smell of an oily rag by a dedicated team with a lot of heart and a huge vision. We will be crowdfunding Subpod on the 12th of March and really need people to get on board and support us by pre-ordering and sharing our campaign with sharing it with their friends for us to take it to the world. To find out more and please visit subpod.com.au and sign up to our email list to stay in the loop. We will honour some great deals for early supporters! Being a part a community that is focussed on creating solutions for sustainable living systems. Creating different environments where people can see and experience how Subpod can be implemented into different environments focussing on composting on location. Working with other like-minded businesses and people creating social awareness around converting food waste into a valuable resource. If we feed the soil we can feed the world! Please visit the website for further details on the Subpod and how you can get involved. To celebrate the opening of our brand new concept store, Habitat Collective, we caught up with retail manager, Tracey Woods. Thanks for your time today Tracey - a simple question to start. Where are you based in Byron Bay? We live just near the Roadhouse [in Lilly Pilly] on the way to Suffolk Park. Lovely! How long have you been living and working in Byron Bay? I’d say three years now. I lived here for about three years over seven years ago, and lived in Tassie in between. I grew up in Tassie and prior to that we lived in Sydney. When you did start working for Habitat? I was hired to manage the retail spaces at the Habitat Home and Habitat Woman pop-ups - the management team had already chosen the brands. The brands had been curated when I took it on, and [both stores were] an empty shell and I had to put it together which was the fun part. What was the attraction of working in a place like Habitat? Well for me the attraction was A) Byron based. Everybody wants to live and work, and be able to survive in Byron. I mean, I just love living here! And B) it was a new project. I’ve been involved in quite a few new projects in my career, and I love something new that you can be involved in from the very beginning and help build. For me it’s just the neighbourhood that’s been created out here - it’s just great. The people are all lovely, it’s a real little community and I love that. How does the new Habitat Collective support the ethos of Habitat? The live, work, play concept? 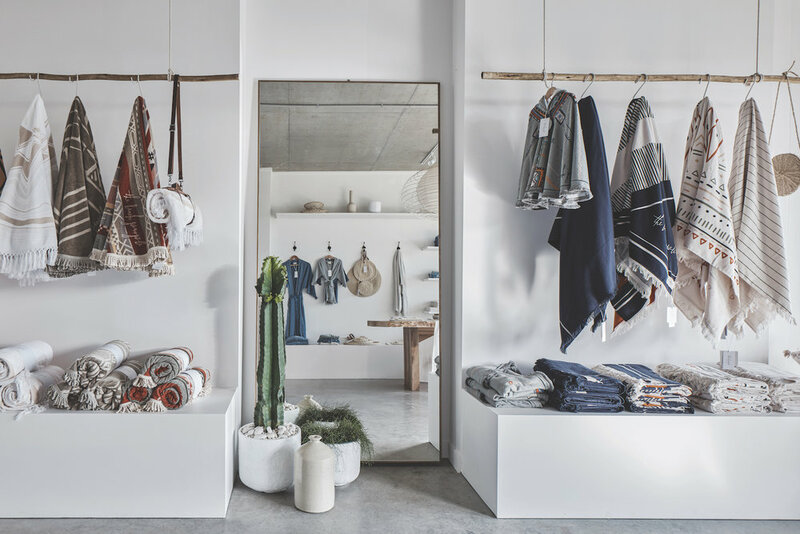 I think originally the brands that were chosen were Byron Bay based brands that whole idea of having local, community, a space for them to exhibit their work was the main thing, so that brought in the makers to the retail front. And for me, I believe that contributes back to the concept of live, work and play. I wouldn’t say we provide stuff that everybody needs within the complex, but I do think that we try to get people to buy local and we try to keep it fresh and change things up. And I think most of the people who visit here have a conscious and they want to buy locally. What sort of visitors do you see in store? We have a lot of repeat customers – locals who come regularly to check out what’s new and to say hello, and a lot of regulars because of F45 and Bende. The people that use the community basically, who come out here and have their weekly or daily coffee they come in and say hello. So we get repeat locals but we also get tourists and repeat tourists. We’ve found we get people coming in who were here when we opened and they’re already coming back. And why wouldn’t you! What brands can we expect to find in store? East Coast General is one that is really popular at the moment – she does handmade leather goods herself, she lives locally, but she also imports some clothing from the States and Europe. We have The Bare Road which is extremely popular as they don’t have their own space in Byron, we always have people asking for them. St Helena which is amazing – Shannon has done an beautiful job with her new summer range. My General Store which is a fantastic small run of beautifully tailored clothing - the fit in her clothes is just amazing. Las Ninas, the lady who brings in individual Mexican and South American pieces. And that’s just a few! We have 40 plus brands at the moment [which have been a merge from the brands at Habitat Home and Habitat Woman]. Do you have a favourite product within the store? There are so many beautiful things. I’m always excited about the new brands coming in! Do you have an insider tip for visitors (or locals) to Byron? Shop out here! Avoid the traffic – it’s just become so intense. I just think you can get everything out here, You can have a beautiful dinner or lunch. Get on the train and come out here! Habitat Collective is open Monday to Friday 9am - 4pm and Saturdays 10am - 3pm. We got to know James Drake, owner and trainer of F45 Training, ahead of the studio’s next 8-Week Challenge. Let’s get personal! Can you tell us where you live in Byron Bay, James? I live in Suffolk Park. We came down in February 2017 from the Gold Coast. How long have you been running F45? I was an insurance broker and my wife owned a cafe which she sold. F45 opened up near my office on the Gold Coast and I started going. I just loved it! I’d never felt better. We always loved the idea of moving to Byron – the drawback being we had to have something to do for work down here. So this was the perfect opportunity and we thought we’d try to bring [F45] to Byron. What was the attraction of Habitat for F45? With the council we were told we couldn’t put a fitness facility anywhere other than a new development. So it just so happened that this was really good timing. They were looking for a fitness facility to come in here. We got talking to Byron Bay Property Sales and found this space and it worked out amazingly well. We had the owner of F45 here the other day and said this was the prototypical studio for an F45 space. Lots of natural light, high ceilings, the perfect space. How do you and F45 Byron Bay support the ethos of Habitat? The live, work, play concept? We all get involved with other co-inhabitants. The biggest part of F45 is a community aspect, so getting involved in the local community in particularly with the tenants of Habitat. We’ve got a great relationship with downstairs [Barrio], they train here and we eat there. We’ve had a few functions where Barrio catered for us. Beau [the barber from Byron Bay Barber Co.] does my hair. We’re stoked about the pool which opened earlier this year – pretty happy about that! What type of person would enjoy visiting F45? It caters for everyone. We work at your own pace in here we have plus 60 year olds in here training alongside 21 year olds. It’s really health conscious, people looking for motivation that the team environment can instil. The community environment is what’s really attractive to a lot of people. It can be daunting at the start! It looks like a boot camp but really you work at your own pace, we encourage progression of exercises, we cater for everyone – if there’s something you can’t do we scale it back to something you can do. There are so many different types of people in here. What are some current or upcoming projects for F45? We regularly host the F45 8-Week Challenge – meal and exercise plan – the training stays the same, so it’s a tailored meal plan. The bloke who won our last challenge lost 14% body fat so absolutely smashed it. The next 8-Week Challenge starts on October 8 and will be our biggest Challenge yet. It’s the perfect time to fine tune your Byron body for Summer. For us newbies, what’s your favourite F45 session? They rotate all the time but at the moment on Fridays we do Fox Trot which is a big cardio session and a great way to end the working week and pump up the endorphins for the weekend. As a local, what’s your favourite thing to do in Byron Bay? A good Saturday morning workout at F45 at Habitat and then breakfast at Barrio! Or the Lighthouse Walk obviously. The 8-Week Challenge kicks off on October 8. For more information or to sign up, visit the F45 Byron Bay website. Where do you live in Byron and how long have you been here? I live in Bangalow. I first came to Byron Bay in 2006 and fell in love with the area. I lived here for a few years and have been trying to find a way to move back permanently ever since! How long have you been working at Barrio? We started working on the concept in June 2017 and opened December 2017. What was the attraction of Habitat for Barrio, and how do you support the Live, Work, Play ethos? The sustainability aspect drew us to Habitat - the location and the community. At Barrio we build community through our food. We do this by forming genuine trust in relationships through our farmers and serving food that embraces the seasons. What can visitors expect to find on the menu? Barrio takes its influence from the wood-fired oven and charcoal grill, a great culinary tradition that enhances flavour and respects the virtues of the product. [Head chef] Francisco Smoje’s cooking is authentic without clinging to convention – working with traditions, but also bringing a new palate of flavour to the Byron Bay dining scene. The breakfast and lunch menu is designed for eating-in or taking away and there’s a selection of sandwiches, toasties and platters full of salads, which greet customers as they arrive. It really is for everyone; families, freelance workers with laptops, those fresh out of the surf or post work-out, locals, tourists. What are the upcoming plans for Barrio? We have just opened on Wednesday nights with feast dinners and a weekly rotating rotisserie. We're also offering off-site catering and hosting more on-site events. I love the cauliflower dish with chickpeas, almond and sage but the side of iceberg lettuce with a sardine yoghurt rach dressing is still one of my favourites, as is the roast snapper with green olivata. As a lovely, what is your insider tip for visitors to Byron? Leave your car at home, walk along the beach and enjoy the beauty of Byron. If you need transport, hire a bike or use the new solar train which will get you from town to North Beach (and Barrio) and back! Barrio Byron Bay is open Mondays and Tuesdays 7am-3pm and Wednesdays to Saturdays 7am-11pm.